Join us in welcoming author Marta Perry! A lifetime spent in rural Pennsylvania, where she still lives, and her own Pennsylvania Dutch roots led Marta Perry to write about the Plain People in her current novels. The author of more than fifty novels, Marta is active in her church and community. 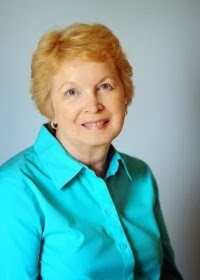 When she’s not writing, she and her husband enjoy traveling, gardening, and visiting their six grandchildren. SS: How long have you been writing? I’ve been writing for more years than I care to count! I suppose I started writing when I was a child and never really stopped, but I started actually selling my work thirty years ago, primarily short fiction. SS: Do you write full time? If the answer is no, what else do you do? If you are a full time author, what other jobs did you have in the past? I’m a full time author now, but in the past I’ve been a teacher and a Director of Christian Education. SS: Tell us about the moment you finally felt like a “real author”? When I walked past the magazine rack in the grocery store and saw a copy of Woman’s World magazine which contained one of my stories. I’d had plenty of short fiction published before that moment, but something about seeing it in a store really brought it home to me. SS: Who has been your greatest supporter as an author? My husband, always. He encouraged me to write even at a time when I could have made more money doing almost anything else. Now that he’s retired, he’s taken over the dishwashing, grocery shopping, and much of the cleaning so that I have more time to write, and he’s always willing to fix his own supper in case of a deadline emergency! What more could a writer want in a spouse? SS: Why suspense? Do you write in any other genres? If so, what? I have loved mystery and suspense since I read my first Nancy Drew book when I was eight. I love writing romantic suspense, but I also write inspirational romance for Love Inspired and Amish romance for Berkley Books. SS: How does your faith play into your writing? I wouldn’t be writing at all if not for God’s guidance. Throughout my writing, I have felt the Lord’s leading in what I write and when I write it. At times, I have resisted and tried to follow my own will, and that has never gone well. In fact, sometimes God has not only opened a door for me, He has booted me through it! SS: If you couldn’t write, what else would you want to do? I’ve held other jobs, but I’ve never found anything I want to do other than writing. I’d write even if they didn’t pay me for it, but please don’t tell my publishers that! SS: Tell us about your current release. There are actually two books out this month. SEARCH THE DARK is the second book in a romantic suspense series from HQN. Books that started in January with HOME BY DARK. The series revolves around three women who spent one eventful summer together when they were ten. Now adults and brought back together again in the same small Amish community, they find that their combined memories will lead them to the unraveling of some deadly secrets from the past. 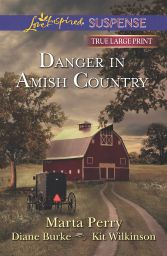 DANGER IN AMISH COUNTRY is an anthology from Love Inspired Suspense of three inspirational romantic suspense novellas, all with Amish settings. In my story. Fall From Grace, an Amish teacher finds danger and love when she attempts to protect a small child who has unwittingly witnessed a murder. SS: Where did you get your inspiration for this book? For Search the Dark, I returned to a theme that I find intriguing—the secrets of the past coming back to haunt the present. And I loved the idea of pairing up the good girl who always fulfills everyone’s expectations with the bad boy who loves nothing more than flouting them! Their romance includes plenty of fireworks before they can hope to find their happy ending. In the Danger in Amish Country novella, I was initially fascinated by an image I’ve seen for years—an outcropping on a country road near where I live that has an uncanny resemblance to a man’s face. As my imagination played with the image, I began to see a body tumbling from the top, and I tried to come up with the least likely person to witness and understand what he or she had seen. The story unrolled from there. SS: What is the main thing you hope readers remember from your story? With both of these stories, as with all my books, I hope readers come away thinking about the power of love to transcend both the past and human frailty. SS: Who is your favorite character in this book and why? I especially like the character of Meredith in SEARCH THE DARK. She is the classic good girl, staying in the small village where she grew up to take care of her widowed mother, sacrificing what her future might have been because of her duty. I tried to show, through her character, both the pitfalls of her choices but also the very real strength of her character. SS: Who is your least favorite character in this book? Why? I could never name a least favorite character in any of my books. They are all my creations, and they all have a little of me in them, even the villains! SS: What are you working on now? I've just finished work on ABANDON THE DARK, the third book in the romantic suspense series. I really loved winding up the series with some twists and turns that I hope the reader won’t foresee. With that completed, I have a full slate with three new Amish romance novels for Berkeley, another three-book suspense series HQN Books, and an Amish Christmas novella for Love Inspired. SS: A tough question: Where do you want to be career-wise in five years? Ten years? I hope that I’m still writing, selling, and finding new readers for my books. SS: Now let’s get a little personal. Name two things on your “bucket list” that you haven’t done yet. My husband and I have done a lot of traveling in the past few years, so I've been able to do most of the things on my wish list. We just returned from a terrific cruise up the New England coast to Nova Scotia, Prince Edward Island, and down the St. Lawrence to Quebec City and Montreal. Fantastic! SS: What is the silliest thing you have ever done? Probably sitting in a tree stand with my teenage son waiting for the sun to come up so he could hunt deer! SS. : Where can readers find you on the internet? My website is http://www.martaperry.com. They can join the conversation on Facebook at Marta Perry Books. SS. : Anything else you’d like to tell or share with us? Thanks so much for inviting me to visit with you! Sometimes the past is best left buried…. Meredith King longs for escape. Life in Deer Run is stifling, the Amish town too small for a modern woman staying just to care for her ailing mother. When a friend enlists her help in clearing the name of an Amish boy whose decades old death is till shrouded in mystery, she welcomes the challenge. But when a ghost from her own past reappears, there is suddenly a lot more at stake. Zach Randal was always a bad boy, and their romance never had a chance. As charming as ever, he returns to town on the heels of a deadly new threat. Is Zach as dangerous as Meredith was always led to believe? Or is the attraction they both feel the only thing that can save them from harm? When one of her students witnesses a crime, Sara Esch gets too close to the truth, and widower Caleb King must risk it all for the woman who’s taught him to love again. Katie Lapp needs her childhood friend Joshua Miller more than ever when someone threatens her late husband’s farm. Can Joshua protect her…even if it endangers his heart? A series of accidents has startled their Plain community…and lead Lydia Stoltz to Joseph Yoder, the man who once broke her heart. At every turn, it seems their shared past hold the key to their future. Marta is giving away a copy of each book! To enter the drawing, comment and leave your contact information. Thanks for joining us! Lovely interview with Marta! Would love to have one of these books. Always love to win books! And I am a suspense junkie! The books sound good, especially Search the Dark. I live in Ohio and years ago we used to go down to Ashland to visit my great-aunt. There are Amish down in Ashland and maybe Mansfield. 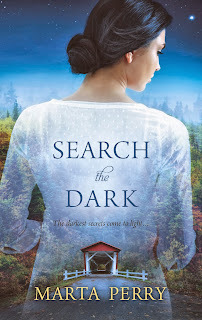 I love the cover for Search the Dark. Thanks for the giveaway! Really enjoyed your interview, Marta, & learning more about you, your writing, & your books. Love the storyline in each of these books, & would love to read them - thanks for the opportunity to win copies! Love Amish books! Sounds like you are blessed to have a husband such as yours, but - he is probably blessed to have you as his wife, also! What a great interview! I would love to be a lucky winner of one of Marta's books. Thank you for the opportunity. Oh yes, I absolutely love the covers and know what's inside will be just as wonderful.